Miquel & Rodriguez (2015 ) published a new paper on fossil shells from Miocene deposits in Patagonia, Argentina. Among them four new species, of which one is placed in a new genus. “A remarkable fossil assemblage composed of five gastropod taxa is described from the Early Miocene of Santa Cruz (Patagonia, Argentina) in southernmost South America. The assemblage includes extinct and living genera South America, and on geographic distributions and represent background new information on spatial and across time distributions as well as identification of new taxa. A new taxon, Patagocharopa enigmatica n. gen. n. sp., is tentatively assigned to Charopidae. Gastrocopta patagonica n. sp. (Vertiginidae) represents the oldest record of Gastrocopta in Argentina and the southernmost record for the Americas. Punctum patagonicum n. sp. (Punctidae) represents the first record of Punctum for continental South America, and characterized by a protoconch with traces of axial costulae and a teleoconch with strong radial ribs. Zilchogyra miocenica n. sp. is the first Miocene record of the charopid genus Zilchogyra. Fragments of a possible Scolodonta (Scolodontidae) are recorded. Overall, the assemblage represents an important and useful paleoenvironmental tool. This fauna suggests that a more temperate and humid environment than today—with a more dense vegetation cover—was prevalent at this site during the Early Miocene”. Although the paper appeared in the September 2015 issue of the Journal of Paleontology, the actual publication date seems 2016. In the PDF I received it says “Published online: 22 March 2016”, while also the copyright is from this year. As new taxa are introduced in this paper, this is relevant information. Miquel, S.E. & Rodriguez, P.E., 2015 . 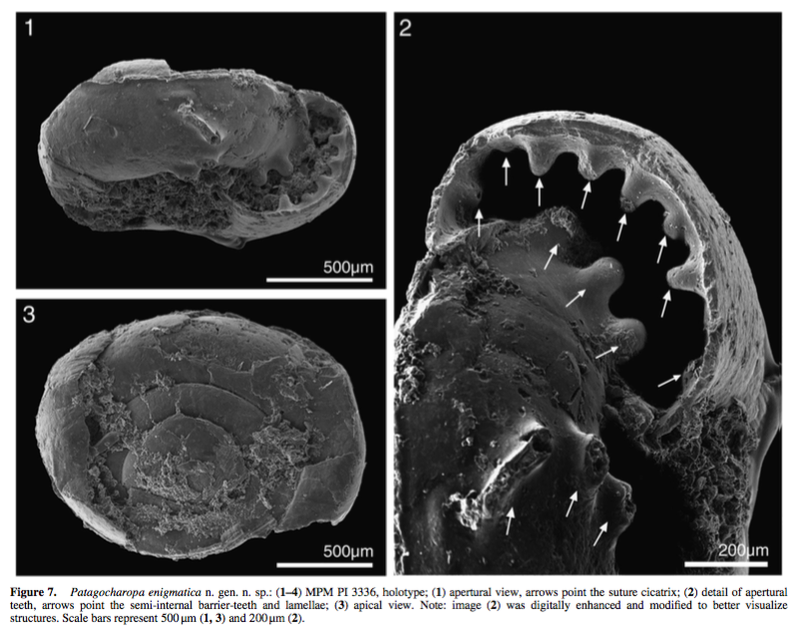 A novel late Early Miocene assemblage of terrestrial gastropods from Santa Cruz (Patagonia, Argentina). – Journal of Paleontology, 89(5): 748-761. This entry was posted in Uncategorized and tagged argentina, charopidae, fossil, literature, Punctidae, vertiginidae on November 2, 2016 by bramb.